Ed Currie is the president of the Puckerbutt Pepper Company in Fort Mill. He holds a Guinness World Record for his Carolina Reaper, the world's hottest pepper. 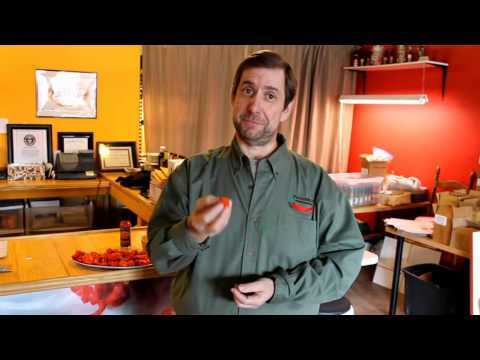 In this video, Currie shows us what happens when you try a pepper that's 300 times hotter than a jalapeno. CLAIM TO FAME: As the breeder of Smokin’ Ed’s Carolina Reaper, the world’s hottest pepper, Currie is the first South Carolinian to achieve an individual Guinness World Record. HOT STAT: Currie eats five to 10 hot peppers every day. IT GETS WORSE: “The Carolina Reaper is just the first of 19 peppers we’re going to roll out that are all hotter,” he says. As he stands in his downtown Fort Mill store, surrounded by chilies, hot sauces and sprouting pepper plants, the intensity in Ed Currie’s voice rises, like the swelling burn of one of his peppers, when he begins talking about his Guinness World Record. A former banker, Currie began growing hot peppers for medical researchers studying capsaicin, the oily compound that creates the fiery burn. It took 12 years to breed Smokin’ Ed’s Carolina Reaper, a “super-hot” chili that registers a blistering 1.5963 million on the Scoville heat unit scale, or 300 times hotter than a jalapeno. Perfecting the Carolina Reaper’s blend of sweet, floral flavors and gut-scorching heat was a labor of love for the self-described “chilihead,” the name for hard-core pepper enthusiasts who test their physical limits, and their sanity, by eating super-hot peppers with names like the Trinidad Scorpion and the Naga Viper. While setting a new world record has been great for business—his store ships out thousands of orders a day, ranging from Carolina Reaper seeds to hot sauces made from the bumpy red pepper—Currie is even more pleased that he’s creating jobs and supporting agriculture in South Carolina. I really like how Ed talks about the pepper with passion and excitement. I was very happy to read this as well, "“The Carolina Reaper is just the first of 19 peppers we’re going to roll out that are all hotter,” he says." WOW!! I didn't think they could get any hotter, but that's awesome. How are they going to continue to come up with super intimidating names for all those? It is already quite amazing to consider that pure capsaicin is 16 million scoville units, while the reaper is 2 million. That means that the reaper is about 12% capsaicin! Amazing to comprehend that this functioning living thing has so much heat in it, while the plant still has the ability to function and reproduce. At some point, it is going to become impossible to create hotter peppers because more capsaicin can't be packed in them. It will truly be astonishing to see a pepper break the 3 million scoville mark. That would be almost 20% capsaicin.